If you’ve read the benefits of turning your office “agile”, you may be tempted to look to the giants in Silicon Valley and take elements from their offices to try and achieve an “agile” version of your own office. But this will not solve your problem. You need to analyse your working environment to show you that a beer tap or a slide will simply not be good enough to benefit your company or your employees. So what are the benefits of turning your office agile? A big one is to reduce real estate, saving you a significant amount of money. A Mitie study predicted that by 2020 the need for commercial office space in the UK will be half that of 2010 and 60% of staff will spend more time working out of the office than in it. Another is employee wellbeing. With employees being the one of the biggest overhead costs for most businesses, companies are realising they need to offer more benefits to attract and retain the best talent. Providing the right working environments for the types of employees and the type of work they do has also been proven to increase productivity. From cubicles and rows of desks, to the open office and agile working; we learn as we constantly develop office interiors. Just as we provide a solution to solve one problem, another problem which needs to be solved develops. Alongside the changing styles of work we also have to adapt to the ever evolving technology. We started with papers and files, then came along the computer. Now we work from laptops and mobiles which are still in need of power and data connections. This is causing one of the biggest problems of the present day – cable management. This is the fundamental point. An agile office should be flexible to be able to deal with constant change. On paper, a certain office layout may make total sense. However, if we monitor the employees and one area is never being used, it needs to be changed. This is an ongoing process. 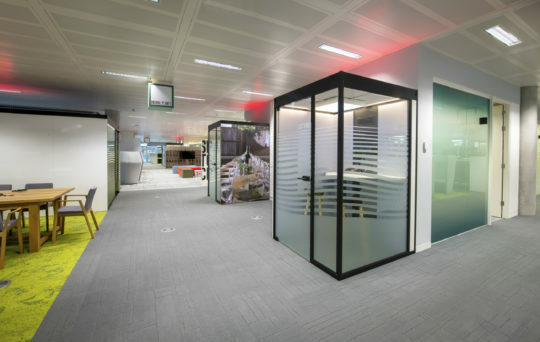 An agile office may be designed and installed, but to be truly agile it needs to be constantly evolving to accommodate the constantly changing work tasks and employees. A scene we developed with eBay for creative tasks. 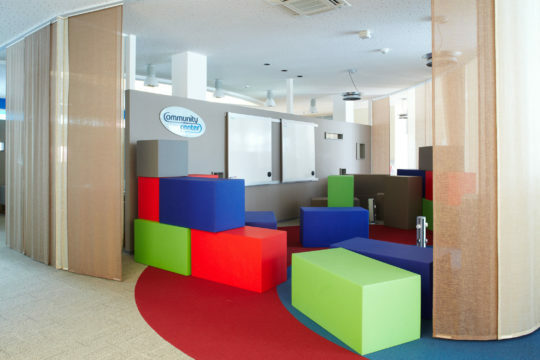 This design allows employees to create their own spaces depending on what they need to do. The scene provides power, flexibility and fun! A desk and ergonomic set up for long periods of computer-heavy work. A pod for private phone calls. Different sized meeting rooms with all the connections for communicating with colleagues on the other side of the world. 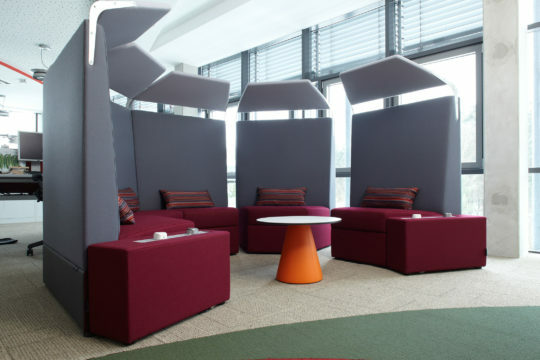 Booths for informal meetings. 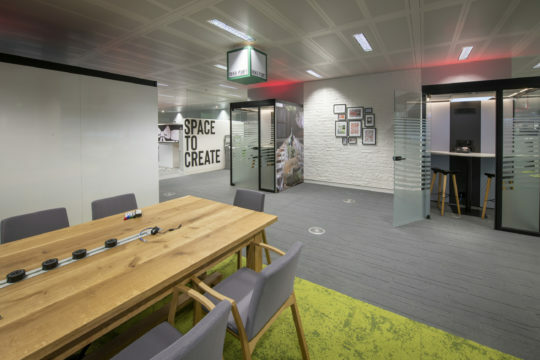 Breakout areas for creative catch ups…the list goes on.